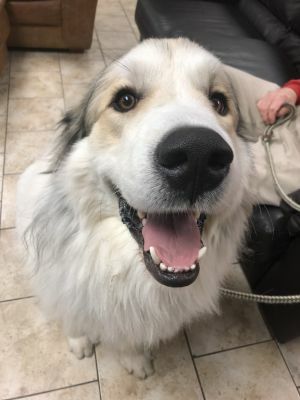 Clint is a beauty of a Great Pyrenees but he would instead like for you to call him handsome. He lived the start of his life as an outside dog and is adjusting to being a pet. He loves to cuddle and play around. He would do best in a home with another canine friend. It's unknown how he is around children or cats. He will require a minimum of a 4 foot fence. Clint is around a year old. His current weight is around 85 pounds. The minimum donation for Clint is $475.00. This includes all of his vetting.